Pseudomonas aeruginosa is one of the most common pathogens found in chronic leg ulcers.1 It frequently leads to stalled wound healing and its unique intrinsic and acquired antibiotic resistances make early identification and selection of Pseudomonas-specific treatment regimes critical in wound care.1-2 P. aeruginosa sometimes presents with clinical symptoms, including a malodorous, greenish crust and a greenish tinge on removed dressings, but frequently no specific signs and symptoms are observed.3 This bacterial species uniquely fluoresces a cyan color on MolecuLight i:X fluorescence images, enabling immediate species identification. "I would not have suspected Pseudomonas on this wound. 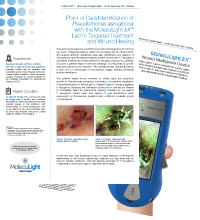 Both the Infectious Disease physician and myself were surprised when the MolecuLight i:X images showed clear presence of the cyan color, which influenced my clinical practice." Rosemary Hill, BSN, CWOCN, CETN(C), with over 12 years of wound care experience, oversees wound care for inpatients and outpatients at Lions Gate Hospital, Vancouver Coastal Health, located in North Vancouver, Canada. 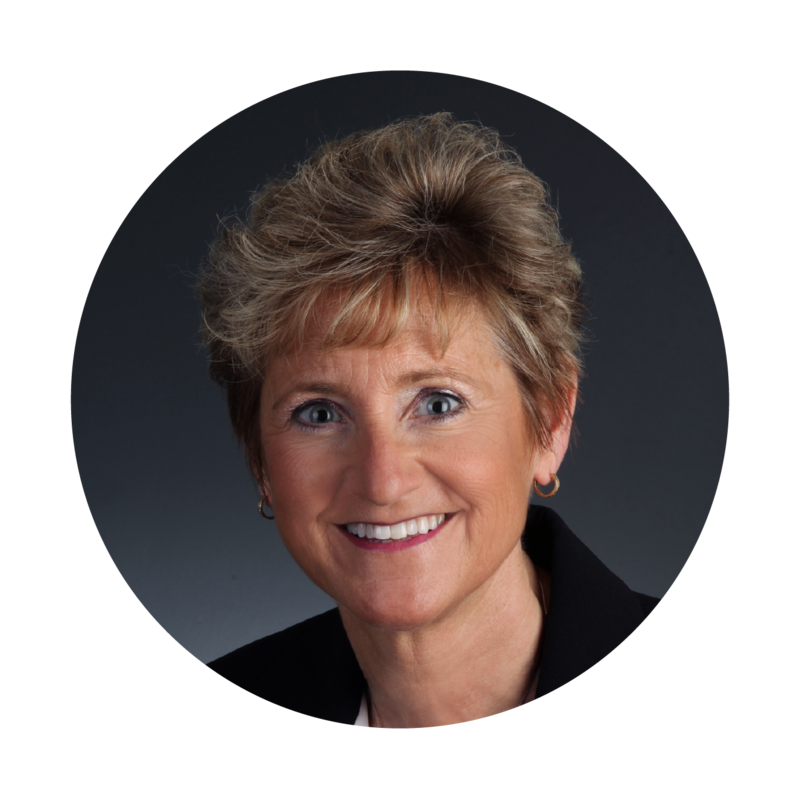 Rosemary is currently President of the Canadian Association for Enterostomal Therapy (CAET). Patient Condition: 74 year old female with a venous leg ulcer for longer than 5 months and confirmed hemangioma. 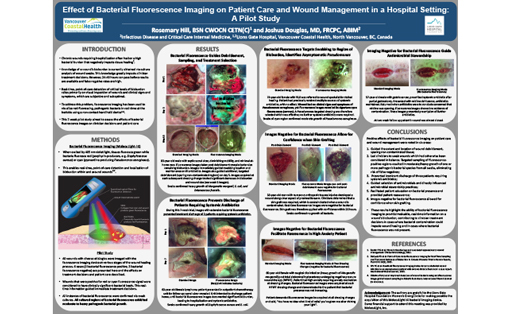 Prior to her referral to the wound specialty team at Lions Gate Hospital, Vancouver Coastal Health for stalled wound healing, the patient had received multiple courses of oral antibiotics, with minimal effect on wound progression. 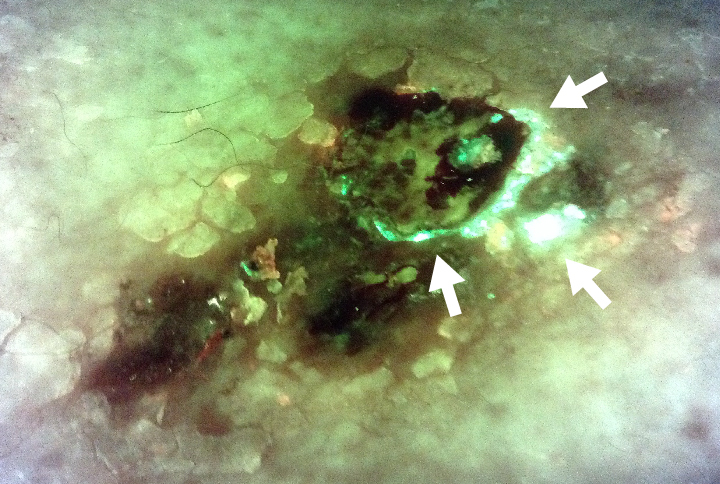 This patient’s stalled wound exhibited no clinical signs and symptoms specific to Pseudomonas aeruginosa colonization, yet real-time visualization of cyan fluorescence on MolecuLight i:X images (Figure 2) strongly suggested P. aeruginosa. Obtaining this information at the point of care led the clinician to immediately select an antimicrobial dressing indicated for use against P. aeruginosa. Swabs taken from regions of cyan fluorescence under MolecuLight i:X fluorescence guidance later confirmed moderate growth of P. aeruginosa. 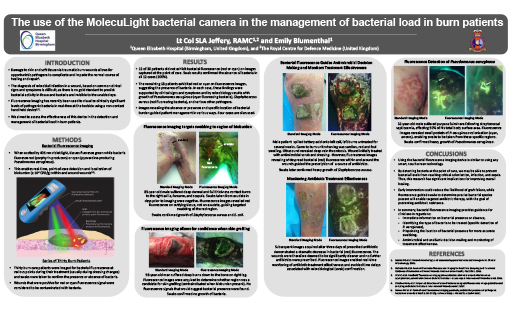 At the next visit, cyan fluorescence was no longer detected, confirming the effectiveness of the chosen antimicrobial treatment and that there was no need for systemic antibiotics. With this effective eradication of P. aeruginosa contamination, the wound began to heal within three weeks. Images provided by Rosemary Hill, BSN, CWOCN, CETN(C), Vancouver Coastal Health, Vancouver, BC, Canada. Serra R et al. Expert Rev Anti Infect 2015; 13(5):605-13. Schmidtchen A et al. Acta Derm Venereol 2001; 81(6): 406-9. World Union of Wound Healing Societies. 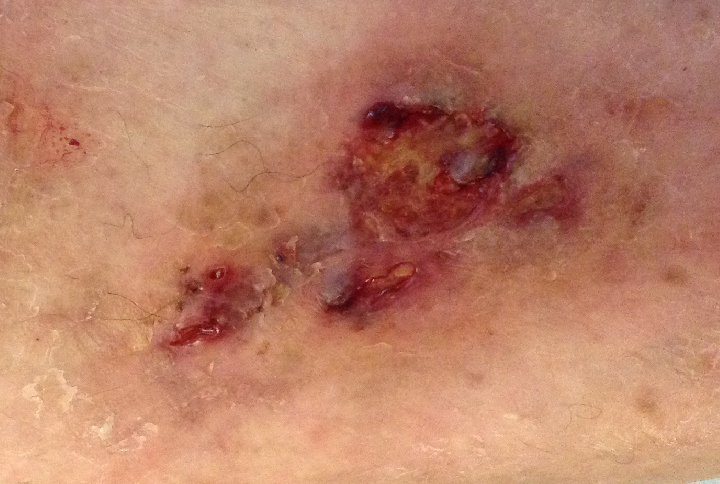 Principles of best practice: Wound exudate and the role of dressings. A consensus document, 2007.